The first workshop in Dickinson, North Dakota was at the Middle School for 5th grade music students, and the second session was for the 6th grade music students. The principal saw the first workshop and decided to bring all the rest of the school to the second session. He even participated in dancing! He saw the value of understanding the foreign culture and made sure that all students got to see and experience this rare opportunity. Manhu is unique, quite different from mainstream Chinese culture. The students now know that many minorities exist in China. So many volunteers want to participate! The end of a workshop – all the students in background give a thumbs up! We had a fun culture-exchanging experience in Dickinson. One evening, Jeremy Wohletz, Assistant Professor of Music at Dickinson State University, and his friend John gathered with Manhu in a residence hall. Jeremy brought his clarinet. John brought his double bass and they jammed together. Manhu played the Blues with Sani instruments and Jeremy and John played Sani folk song with clarinet and bass. The sound of music must have traveled through the hall; student residents came down and enjoyed the unusual, unexpected jam session. Jeremy, John, Josh and Manhu jamming at night. On our day off we drove to Fort Berthold Reservation where we met Keith Bear. I first met Keith Bear at an Arts Midwest World Fest tour in 2003 in James Town, ND. I haven’t seen him since 2004. I kept in touch and contacted him on this tour. We met at the Three Affiliated Tribes Museum. He escorted us to Earth Lodge Village where his friends awaited us. 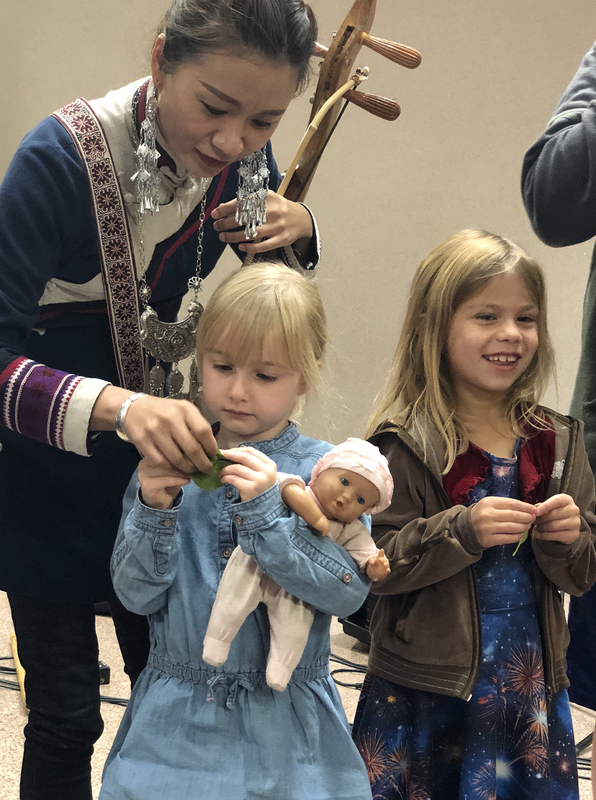 Upon our arrival Mandan people hosted a welcome reception with the feast of their food, traditional dance and drumming in their full traditional regalia. I didn’t expect to receive such a welcome and to celebrate this occasion. Manhu, Josh and I were completely speechless and mesmerized by the exhibit of their culture. As tribal custom Kieth asked us to dance together in circle to celebrate our encounter and be grateful of this occasion. Manhu also asked Mandan people to dance to Sani dance. We both expressed our gratitude and wish to meet again someday. Keith Bear plays hulusi and Wang Tao plays a native flute made by Kieth Bear. Keith gifted his handmade flute to Wang Tao. The public concert was held at Becker Auditorium of Dickinson State University. The atmosphere was very much like in Pierre, South Dakota. Audience members sat close to the band and were able see the details of Manhu’s instruments and traditional costumes. Alan’s graceful movements, her beautiful voice and her hand embroidered dress always captivates the audience. At the end of the concert the audience was asked to join in a traditional Sani dance. We encouraged everyone to get on their feet and step, step, step and kick. Little by little people stood up and held hands together and joined the dance. The success of the concert was visible by the standing ovation of audiences. Home schooled children came to attend the workshop. Alan gently shows a four-year-old girl holding her doll how to hold the leaf. Alan in her traditional hand embroidered dress. Standing ovation. People loved the concert.